Upgrade your pocket knife with this Freemason inspired "In search of more light" folder! 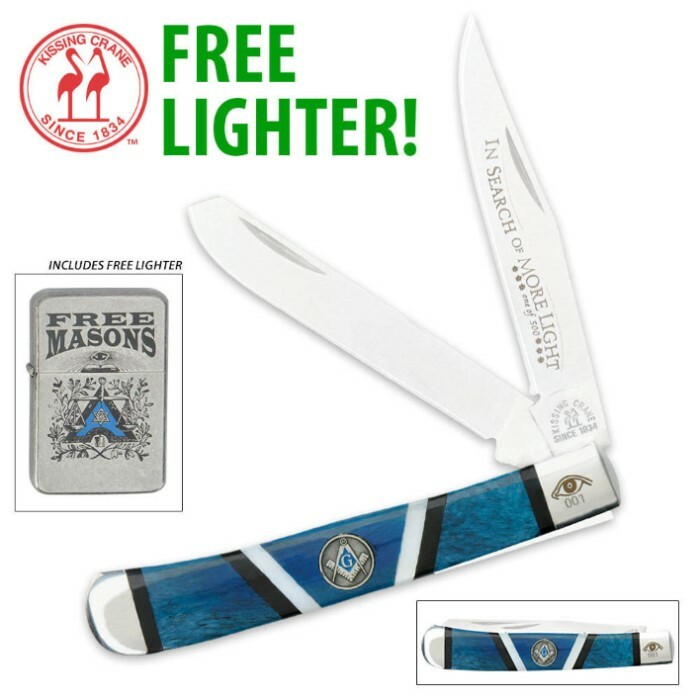 This trapper style knife features dual 440 stainless steel blades with etching, blue bone handle scales, a Masonic logo medallion, and the "all seeing eye" artwork. Nickel bolsters and accents complete this piece, and each is laser serialized. Measures 4 in. overall when closed. I got this knife in a surprise bag it came sharp but when i opened it and closed it a few times part of the wood came of but was glued on easily overall a great knife. This set is of excellent quality (though the lighter is not a zippo)for any Mason or someone getting a gift for a mason. Great knife. I got it out of the $50 suprise bag so i didn't get the lighter but the knife is exellent. This is an excellent gift set. Both the knife and the lighter are of excellent quality and very nice to look at as well. The pocket knife is functionally large as pocket knives go and well made. This is a great buy. The combo is GREAT I like them both. I give them to PAST WORSHIPFUL MASTERS.